The Inn on Fifth - Welcome! Reimagined for truly discerning travelers, the Inn on Fifth offers a new level of luxury in the heart of Old Naples. 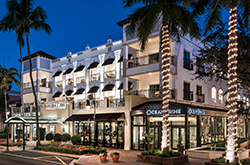 The hotel’s two iconic structures face each other across fashionable Fifth Avenue South, mirror images of elegance reflecting the best of downtown Naples and its celebrated entertainment, shopping and dining district. And with a sugar-white stretch of world famous beach just a short stroll down the avenue, and easy access to some of Florida’s most exclusive golf courses and legendary natural attractions, the Inn on Fifth is one of Naples’ most enviable locations. The Inn is home to 119 elegantly appointed guest rooms and suites, including 32 luxurious Club Level Suites in a separate private building. Each spacious room features stylish furnishings, contemporary design and luxurious bedding, with access to Juliet balconies or terraces for taking in the warm breezes or vibrant streetscape below. Sophisticated yet unpretentious, the Inn on Fifth is intimate in scale and rich in amenities. All guests can enjoy the Inn’s rooftop oasis pool, chic Spa on Fifth, two award-winning restaurants and 24-hour fitness center. Naples Club Level Suites provide an enhanced guest experience, with personal concierge, secluded rooftop retreat, daily culinary delights and so much more. Come enjoy the relaxed refinement that has made the Inn on Fifth an enduring Naples classic. The Inn on Fifth in Naples, Florida has expanded its hospitality offerings with a new luxury addition directly across from our existing hotel. 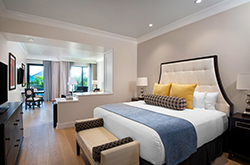 Opened in December 2012, the Inn’s 32 Club Level Suites offer expanded hospitality with added features and amenities to create a new standard of luxury in Naples. Located in a newly constructed, 40,000-square-foot building directly across from the Inn’s original landmark location, the Club Level Suites are grand in scale – ranging from 516 to 1,200 square feet – and feature lavish furnishings, sensuous bedding, designer bath amenities and furnished balconies with views of downtown Naples. Guests in this private enclave enjoy myriad added services and exclusive added amenities. Plus, Two Club Level Presidential Suites boasting 2 bedrooms and 2 baths with over 1,100 square feet. Most Club Level suites will have a large balcony with views of downtown Naples Fifth Avenue South. The second floor will feature the Naples Florida Presidential Suite with its 500 square foot balcony overlooking Fifth Avenue and Park St. While the third floor will feature the Fifth Avenue Presidential Suite with each room having its own private balcony. Guests in this intimate enclave will also enjoy a range of pampering services and exclusivity. The new building will include a private rooftop sundeck and whirlpool spa for luxurious relaxation. Club Level service will feature daily deluxe Continental breakfast, afternoon tea and evening cocktails with appetizers; complimentary transportation to & from the Naples Airport and around downtown in our full-size luxury Cadillac Escalade SUV. In addition to deluxe accommodations, there is an elegantly appointed 700-square-foot boardroom that is ideal for executive meetings or corporate retreats. This suite offers a bedroom with one Stearns & Foster Tivoli Elegance Luxury Plush Euro Top king sized bed and the bedroom is connected to a spacious living room with balcony. The living room is equipped with a queen sized pullout bed. Amenities include a refrigerator, a glass shower and separate bath tub, the signature Inn on Fifth pillow-top mattresses covered with triple sheeting, three phones with voicemail, wireless internet access, 2 X 42” flat screen HDTV and 1 X 19” TV in the bathroom, and waffle weave robes. Suites can accommodate up to four people. This suite offers a bedroom with two queen sized Stearns & Foster Tivoli Elegance Luxury Plush Euro Top beds and the bedroom is connected to a spacious living room with balcony. The living room is equipped with a queen size pullout bed. Amenities include a refrigerator, glass shower and separate bath tub, the signature Inn on Fifth pillow-top mattresses covered with triple sheeting, three phones with voicemail, wireless internet access, 2 X 42” flat screen HDTV and 1 X 19” TV in the bathroom and waffle weave robes. Suites can accommodate up to six people. This suite offers a bedroom with one Stearns & Foster Tivoli Elegance Luxury Plush Euro Top king sized bed and the bedroom is connected to a spacious living room with balcony. The living room is equipped with a queen sized pullout bed. Amenities include a refrigerator, glass shower and separate bath tub, the signature Inn on Fifth pillow-top mattresses covered with triple sheeting, three phones with voicemail, wireless internet access, 2 X 42” flat screen HDTV and 1 X 19” TV in the bathroom, and waffle weave robes. Suites can accommodate up to four people. Each bedroom offers one king sized Stearns & Foster Tivoli Elegance Luxury Plush Euro Top bed with the signature Inn on Fifth pillow-top mattresses covered with triple sheeting and is also equipped with 42” HDT. Each bedroom has an en suite bathroom with double marble vanities, glassed in shower, bathtub and a 19” TV. The large living room features a queen sized pullout bed, a wet bar with refrigerator, a 52” television and a French door to large balcony with sweeping views of downtown Naples. Presidential suites are equipped with five telephones with voicemail; wireless internet access and luxurious waffle weave robes. On the second floor the Naples Florida Presidential Suite features a 500 square foot balcony that overlooks onto 5th Avenue and Park St. The third floor features the Fifth Avenue Presidential Suite features three separate balconies. Each room has a private balcony and so does the living area. The Inn on Fifth is home to 119 elegantly appointed non-smoking guest rooms and suites, including 32 luxurious Club Level Suites in a separate private building. Each spacious room features stylish furnishings, contemporary design and luxurious bedding, with access to furnished Juliet balconies or terraces for taking in the warm breezes or vibrant streetscape below. From stylish hotel rooms to extravagant Presidential Suites, the Inn on Fifth and Club Level Suites wrap guests in luxurious, breathtaking comfort. In our continued commitment to improve the comfort of our guests, we are proud to advise you that our water is filtered with a state-of-the-art filtration system with a water softening component. Our water is equal in quality to most of the bottled water found on the shelf of grocery stores. Sliding French doors in every room and suite lead to a Juliet Balcony or terrace with comfortable cushioned rattan furniture, where you can relax in the tropical breezes and enjoy the streetscape views. For a truly tropical experience, book your accommodations in a scenic poolside room in Naples' best hotel. Forty-eight large 400 square-foot rooms located throughout the hotel, offering a variety of views, from the sparkling pool to fabulous Fifth Avenue. Fourteen large 400 square-foot rooms with excellent amenities and walk-out balconies appointed with rattan rocking chairs. Five 500 square-foot oversized rooms with king beds, a cozy pullout sofa, Italian marble bathrooms, and all the amenities of our suites. Junior Suites overlook the plaza, Fifth Avenue, and the pool deck. Two fabulous 550 square-foot suites that feature all the enticing features of our terrace suites, tucked away in the rear corners of the building for a quieter, more secluded experience. Four elegant 550 square-foot suites opening onto large balcony terraces overlooking scenic Naples' Fifth Avenue. Open the double doors and you’ll feel the pulse of fabulous Old Naples. The bedroom features a king bed, and the living room offers a cozy pullout sofa, working desk, and a flat-screen TV. Three telephones are located throughout. Each suite has a luxurious Italian marble bathroom, and two of the terrace suites have relaxing Jacuzzi tubs. With nearly 8000 square feet of indoor and outdoor meeting space and exceptional on-site catering, the Inn on Fifth provides all you need for a successful meeting, corporate retreat, or social event. Choose from a variety of settings, each ideal for small to medium-sized groups – poolside terraces adorned with tropical flora, luxurious indoor ballrooms, elegant boardrooms. Onsite catering is available, as well as business-friendly amenities such as complimentary Wi-Fi and voicemail. You will also be assigned your own Conference Services Manager who will attend to your every need before and during your event. Request a proposal today or contact the Sales Department at (888) 403-8778. The luxurious Spa on Fifth is an intimate escape to sooth, heal, cleanse and refresh the body, mind and senses. Inspired by Eastern philosophy, the Spa’s tranquil ambiance blends Feng Shui elements with tropical accents to create an award-winning ambiance guests cherish. Skilled technicians see to every need, guiding guests through an array of signature treatment options to personalize each spa experience. Our Spa on Fifth offers a unique variety of massages, facials, wraps, scrubs and other treatments. Saunas, steam rooms, fitness center and a relaxation lounge are among the Spa’s other features. In the privacy of luxurious single or couples treatment rooms, guests are pampered with deep-cleansing facials, full-body massages, invigorating scrubs and many other treatments designed to recuperate, rejuvenate and revive.The Spa on Fifth uses only the finest all-natural products, including organic botanicals and therapeutic-grade essential oils. Signature Massages from deep-tissue to light touch, available in 60 or 90 minute increments. Miracle Facials restores and rejuvenates skin with all-natural ingredients such as deionized water, avocado oil, Dead Sea mud, and jojoba oil. Reflexology centuries-old practice using acupressure on the hands and feet to relieve and relax the body. Body Wraps designed to ease tension, relax muscles and joints, and repair damaged skin, most wrap treatments last more than an hour. Elite Body Scrubs invigorating treatments to gently exfoliate the skin, giving it a smooth, healthy glow.